Last year at my museum's Civil War Weekend, I was not very well kitted out. I had a decent corset, a good cage from Kay Gnagey (worth the money, by the way), a secondhand dress that fit perfectly, an 1840s chemise that's too tight under the arms, and a knee-length 1950s-style crinoline I used as a petticoat (which was awful but better than nothing). So the plans I laid out in December have been changed, because without firm deadlines I won't finish anything. 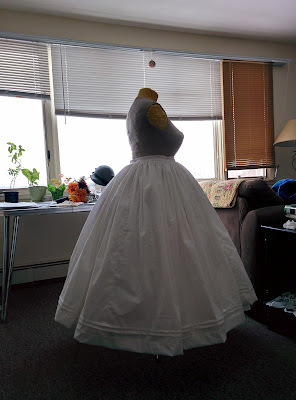 Instead, I'm using the first half of the year to get everything together, starting with a pair of petticoats. This is especially important as I'm going to do a "Dressing the Fashionable Woman" presentation and need to have every layer in viewable condition. Liz Clark's instructions for petticoats describe pretty much what I did; I used the patterns at the end of Patterns of Fashion I to calculate how much yardage to buy, and otherwise just sort of winged it based on normal skirt construction. At first I meant to gore them to help get the more elliptical wartime look, but extant petticoats show gathered fullness and so I went with that. Both petticoats are identical, or at least they're meant to be. 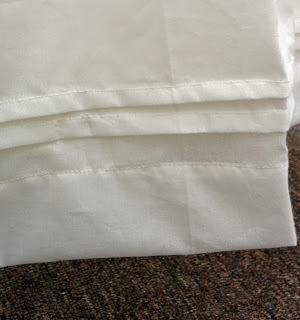 As this is, of course, the tucks & pleats challenge, I put two tucks near the hem on each. This will help the petticoats stand out, as well as be a bit of decoration. If I were to make an 1840s or early 1850s outfit, I could add a couple more and make it the proper length to be worn without a hoop. Each petticoat is 180" around (kind of excessive, but I felt I'd rather have it than want it), tightly gathered at the top, and stitched to the waistband using the stroked gather technique. I ended up with 22 gathers per inch. It's kind of intense. How historically accurate is it? They're pretty accurate apart from the plastic buttons and the fact that any Victorian would turn up their nose at the fabric quality. 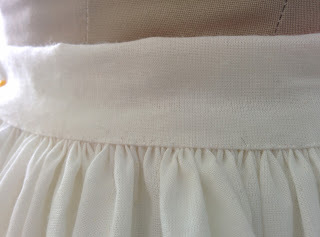 I used my treadle machine to sew the vertical seams, tucks, and hems - according to the petticoat linked above, such things were done. The stroked gathers and buttonholes were done by hand. Hours to complete: Oh man. About six hours each for the gathering and attaching the waistband. An hour to pin up and sew the hems. Maybe an hour and a half to do the tucks, I didn't take the time to make sure they were properly straight. Another half hour for the buttonholes and buttons. All together that comes to 15, which sort of feels like an underestimation. I'm sure it took you more than 15 hours just for the gathering stitching. It's quite lovely. I must see your presentation! Yeah, I'm thinking that maybe it took me more episodes of Our Mutual Friend than I thought - it might be more like 16. Have you got pictures of what your makeshift outfit with the 50's petticoat looked like? 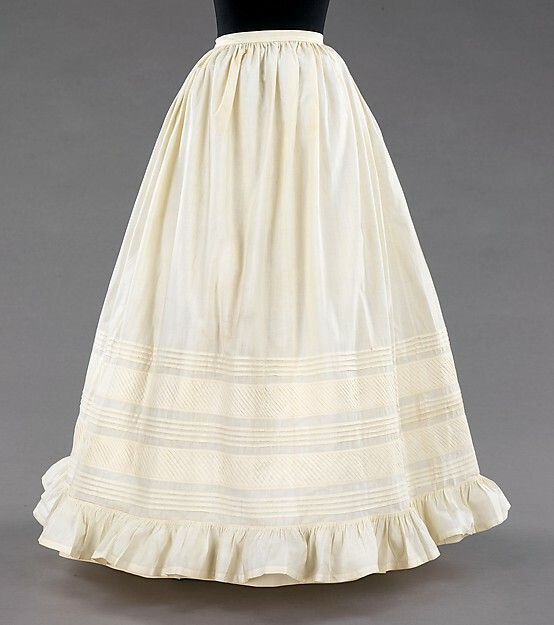 I'm erm...thinking of doing my own 1860's in a hurry on a budget dress. The only one I can find online just now is my cropped profile photo, which I specifically cut to hide the bottom of the skirt! It made a kind of a bulge at mid-thigh and then all the hoops below it were really obvious, especially as we were on the St. Lawrence River and it was breezy. I wouldn't recommend it. 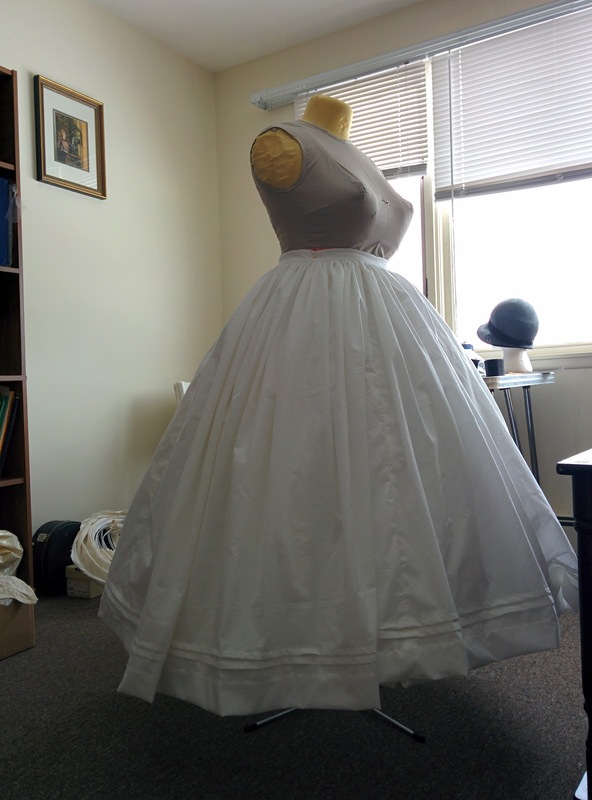 A thrift store sheet petticoat is a better option.